Malaga United Methodist Church founded in 1884, located in Malaga, NJ has been seeking to better its community through the power of faith and love. We have sought to create a welcoming environment paired with a loving outreach ministry. By creating many programs for people of all ages and trades, we help our members come together in faith and in everyday life. Malaga United Methodist Church's mission is to spread God's love within the immediate community. With a message of acceptance of all races and denominations, we seek to bring the community together under a common understanding of faith. We seek to enact community outreach programs demonstrating the love of our Lord and Savior. By doing this, we effectively aid our members and community just as we are taught to do in the scriptures. By standing squarely within the intersection of faith and life, Malaga UMC is able to provide its members a fun and exciting experience. We seek to provide a sanctuary for growth so that members gain a deeper intimacy with God and a stronger relationship with each other. Malaga United Methodist Church's members and staff are here for you in times of joy and times of sorrow. Come and experience God's love with us and allow Malaga United Methodist Church to usher you into our loving community. Our aim is to make our services comfortable & user-friendly for everyone, those who haven't been in church before and for those who attend regularly. We don't want anyone to feel out of place. Our worship services are easy to follow because they feature a multi-media format including easy-to-view presentations & lyrics on a large screen with a blend of traditional hymns & contemporary praise songs. We focus on messages that challenge everyone to live and grow in Christian love. Hymnals, Bibles & Bulletins are also available for those who wish to follow the service in a more traditional format. Worship with us on Sunday's at 9:00 a.m.. Ask our greeters for details if you have any questions. Some of our amenities include a paved parking lot, an elevator for the handicapped, a driveway between the Church and Parsonage for those needing to be dropped off for elevator access, two restrooms at the sanctuary level, Sunday School classrooms, a Fellowship Hall and Wi-Fi access. We love because God first loved us! We offer a Safe Sanctuary where everyone can Worship in Peace regardless of their social preferences, race, color or creed. The People of Malaga UM Church treats everyone like family by providing a safe and friendly place of worship and growth so that we might all live as faithful disciples of Jesus Christ. Everyone is invited to come out and see if our church family is what they are seeking. We gladly answer any questions a visitor has and Pastor Charlie would be honored to answer any doctrine questions that you might have. the forgiveness of sins, the resurrection of the body, and the life everlasting. Amen." The Greek initials in the phrase "Jesus Christ, God's Son, Savior" spells the Greek word for fish: "Ichthus." The "Ichthus" fish is a sign Christians have used to identify themselves throughout history. One believer would draw the top half of the symbol in the sand and the other believer would finish the bottom half. That's when they knew it was safe to talk to one another about their faith. We at Malaga are inspired by the Ichthus and believe God created man to be in fellowship with Him and one another. A fish is a fish, even out of water -- but soon it will be a dead fish if it stays out of water. A Christian is still a Christian out of church -- but soon he/she will be a dead Christian if he/she stays out of church. Fish swim in schools for protection - and the greater good of the group. Just as fish live in schools, so, too, must Christians live in a community. After their conversion, the early believers in Acts Chapter 2 gathered together to study the word, fellowship, worship and break bread -- all done together to edify, unify and strengthen the body for the glory of God. There is no such thing as an individual Christian or an individual Church; we are all connected through the binding love of Jesus Christ. The Gospels tell us of the early disciples being called from their profession as fishermen to become "fishers of men." So the fish is a reminder for us of the Great Commission in Matthew 28, "to go and make disciples of all nations." 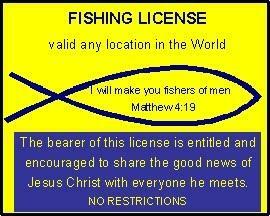 Every one of us is called to become "fishers of men." We'd love to have you come drop your line in our pond and fish at Malaga United Methodist Church.